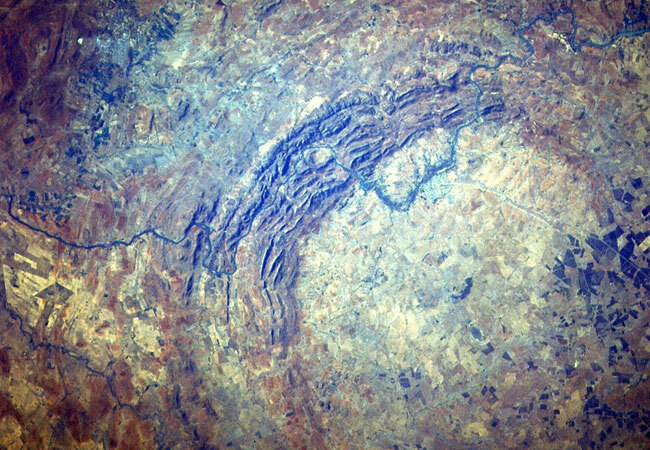 The Vredefort Dome is the oldest and largest Meteorite Impact Site (Astrobleme) in the World. Formed an estimated 2000 Million Years ago when a gigantic meteorite (larger than Table Mountain) hit the Earth close to where Vredefort is today. The Vredefort Dome is a UNESCO World Heritage Site in South Africa’s Northern Free State. The Town of Vredefort, lies more or less in the Centre of the Vredefort Dome – the remains of the largest impact crater still visible on Earth, but the Town that is most commonly associated with the Dome is Parys on the banks of the Vaal River, which flows from its source on the Highveld down through the dome area. The ‘crater’ Area is just over 2000 Million Years old, but the rings of what was once melted rock can still be seen clearly in images from Space. The actual Crater (its original diameter estimated at around 300 km) has long eroded, but this erosion has revealed a partial circle of large upturned Rocks (sometimes called the ‘Bergland) with a diameter of about 45 km. This is the remains of what was pushed up from the Earth’s Mantle by the impact of a meteorite. Scientists believe to have been at least 10 kms across. The Vredefort Dome was declared a UNESCO World Heritage Site in 2005, making it one of 8 World Heritage sites in South Africa. It is the biggest and oldest known impact relic from a time when life on earth consisted of simple algae, and the meteorite that hit at what is now Vredefort, is also thought by many in the scientific Community to have possibly played a significant role in the evolution of life on Earth. There are many things to do in the Vredefort Dome area, including visiting the information Centre in Venterskroon or the Parys Museum to learn about the Dome and view Rock Samples. Even if you are not Geologically minded, there are many activities centred around Parys and Vredefort that take advantage of the local Geology. These include: River Rafting on the Vaal River; Hiking: Trail running; Mountain biking; Horse trails; Guided Geological and Dome Tours; Quad-biking; Abseiling; Hiking…the list is almost endless, as the Area is an Outdoor and Family adventure, Team-building and Group adventure activities, Mecca.